This is a 1:12,500 scale map (defence overprint) of the region of Groesbeek South, Holland. It is the first edition of this map, published on February 2, 1945 by the Royal Canadian Engineers. 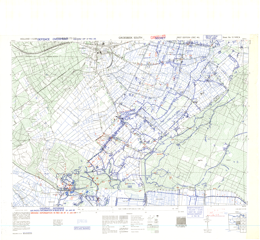 This overprint was referenced from air photographs taken January 24, 1945 and ground information taken January 31, 1945, and utilizes the Nord de Guerre Zone Grid (Blue). Production information for the base map is 8M/1/45/3RCE/5556. Production information for the overprint is 5100/2/45/3RCE/5611.